I have lived, worked and owned apartments, townhouses and homes in the wonderful communities of North and West Vancouver since 1974. My two children, now 35 and 38 were born and raised in North Vancouver . I am a wealth of information about all resources and activities available in North and West Vancouver, including school systems, community centers, recreation facilities. I can also assist you in sourcing exceptional home services providers - designers, decorators, contractors - to name a few. I make myself totally available for your needs and pride myself on excellent and professional service. I graduated in Psychology and French, (1971) from Carleton University , Ottawa (Marianne Koves) . Upon graduating, I worked with a Psychologist as a Psychometrist (learning how to ask questions and listening to people's needs), and as a Real Estate Conveyancer and Title Searcher, where I learned many fundamentals of my current profession. Am completely fluent, read and write Hungarian and great comprehension of French. Joining Prudential Sussex Realty in 1990, I earned Rookie of the Year status, and in 1994 earned my Associate Broker designation, and continue as a consistent Top Producer. 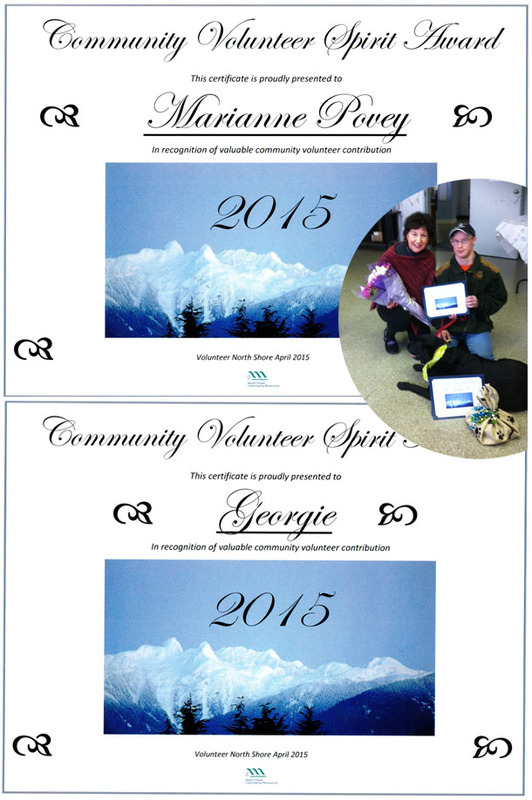 I am environmentally and community minded and participate in a wide variety of volunteer roles; Palliative Care volunteer at Lions Gate Hospital, served on Council in Strata Corporations, facilitator in a Negotiations Course at Capilano College, as well as canvasser and team leader for the Canadian Cancer Society, and recently a Pets and Friends Volunteer with Georgie, my 5 year old Black Labrador. I have a special fondness for animals and an active supporter of the SPCA, WWF, Elephant Sanctuary and OWL. In my spare time I enjoy hiking with my black labrador, running, cycling, reading, gardening and knitting. 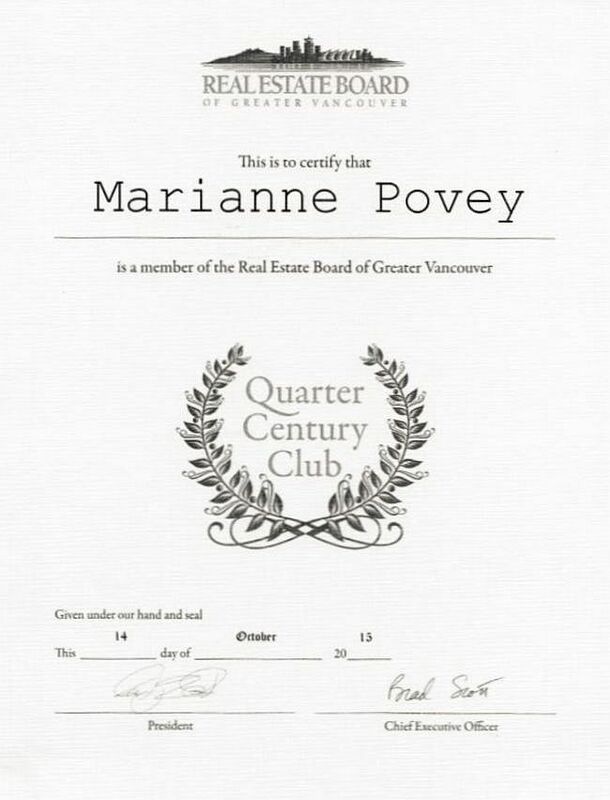 I have a serious and professional commitment to being a full time Realtor, and am a true advocate of the wealth of opportunities for anyone buying or selling a home in North, West Vancouver or Greater Vancouver. "We have known Marianne for several years now and when it came time to review our options regarding the housing market; we did not hesitate to ask her if she would assist us. Even though we regard Marianne as a trusted friend, she always treated us with absolute professionalism with all her dealings with us. She is an astute and very experienced realtor and her knowledge of the local housing market is second to none. She responded to all our emails and phone calls at all hours of the day and night and never complained. Marianne is a very confident and positive realtor – nothing seems to get her down - she was always a positive influencer. In the end Marianne sold our “old” home for above asking, and then played a pivotal role in both finding and successfully negotiating for our “new” home – thank you so much Marianne, we just love our new home! Her paperwork was excellent and the follow-up customer service was top-notch! It was a pleasure to work with Marianne (and her team) and we will definitely come back when we are ready for our next move! " "To anyone who reads this letter I recommend Marianne with all sincerity. She sold the home in 5 days and I got $31,000 more than we were asking. I never felt pressured or unsure with the preparations Marianne recommended. At the end of the 5 day sale period she sent me not 1 but 5 offers." "I can only commend Marianne! She helped my family and me greatly with the difficult task of selling a much loved family member’s home. An estate sale was an emotionally challenging undertaking none of us had experienced. Right from our first meeting with Marianne, our many concerns were put to rest, and her experience and knowledge made us feel very comfortable knowing we were in good hands. She answered our many questions clearly, and made many suggestions which proved to be very beneficial. All negotiations went smoothly, and we always knew the final decisions were ours. She helped us every step of the way! Thank you again, Marianne, for making a difficult undertaking proceed as smoothly as it did." "Marianne was recommended by a fellow realtor who valued her combination of warm ease, underpinned with deep experience and uncompromising professionalism. My home is my largest asset, therefore, it was important to be completely frank discussing the nature of the transaction, without disturbing our working relationship. Marianne understood each concern, bringing practical and focussed insight to bear. She informed me of trends, however never lead me to a conclusion or assumed my preferences. She listened, commented and allowed me to come to my own place of comfort, based on solid information. My home and privacy were secure in her hands - in two instances, Marianne moved with uncompromising action to address unprofessional behaviour by others in related fields. She was able to do all the above, and bring the deal to a satisfactory close, with decorum. I would recommend her without hesitation." "Dear Marianne It has been such a pleasure selling my home through you. From the very beginning you were organized, with comprehensive explanations of every process and stage. you were always in touch, prompt with communication, innovative in promotion and thorough in assessing value. Most of all your positive attitude was such an asset. I would not hesitate to recommend your services. Thank you. Your professionalism was most appreciated." "I have just completed my third house move with Marianne's wonderful help. On every occasion, I have been delighted by her attention to every detail, and answers to the issues we have encountered along the way. Marianne is unfailingly pleasant, supportive and positive, and always available, as she limits the number of clients she represents at any one time. I have no hesitation in recommending her services." 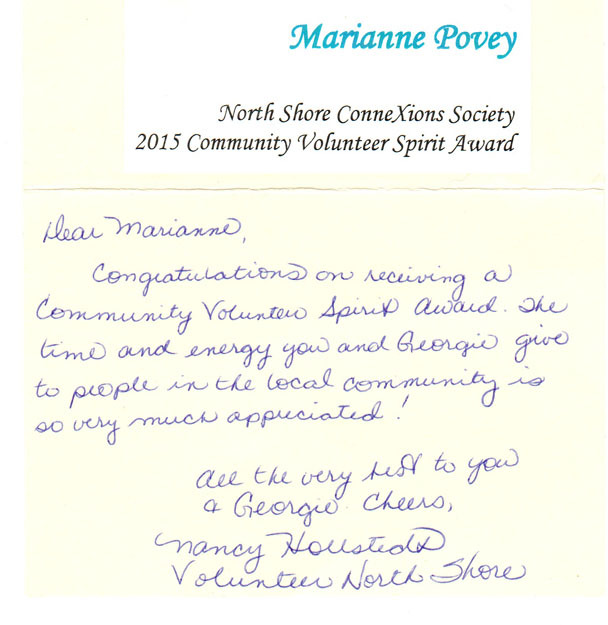 "Dear Marianne: Thank you for making it possible to move to North Vancouver so smoothly. By the time my house was SOLD you and I knew exactly what I was looking for. It took 1 and 1/2 days to find my new place and have an accepted offer. You made every effort to easy my anxieties throughout the process. Thank you for being supportive and reassuring"
"If you want a Top Notch professional Realtor who will bring all of her experience to bear on all aspects of the sale of your home - CHOOSE MARIANNE POVEY!" "To anyone who reads this I recommend Marianne with all sincerity. She sold the home in 5 days and got $31,000 more that we were asking. I never felt pressured or unsure with the preparations Marianne recommended. At the end of the 5 day sale period she went me not ONE but FIVE offers. If I had the qualities I recognized in you I would still be in real estate." "We really appreciate everything you did for us - your advice and your professionalism has meant a great deal to both of us. Thanks again for helping us find our house - your experience made it happen." "My wife and I were very pleased with the sale of our home. It sold quickly, and with a minimum of disruption to our lives. A very stressful time was made much more pleasant by you. Excellent service overall. Thank you very much!"